Where Can I Go To Sign or Get A Petition? How can I join in and volunteer? Yes, you can sign all three petitions! Even if you don’t live in that district! Any registered voter in the Jefferson County Public Schools district can sign! 15,000 signatures need to be collected per petition. They have 60 days to get it done! If you are a U.S. Citizen and 18 years of age or older, you can carry a petition. Wasted hundreds of thousands of taxpayer dollars on their own attorney and public relations consultants. Ignored legal advice and walked away from valuable property. $280,000 annual compensation for new superintendent whose highest level of experience is just over 3 years as an assistant superintendent in Dougco (a much smaller and less diverse school district). $850,000 to GT programming, contrary to Community Budget Survey. Over $7 million diverted to charter school equalization, contrary to wishes of the community on the Community Budget Survey. Consistently opposed putting needed funds into reserves. Reduced public comment time to one minute to three minutes per person, depending upon the direction of the wind on the night of board meetings. Attempted to move students out of their neighborhood schools, without talking to the community first. Attempted to cut two thirds of the nursing staff at Fletcher Miller (Jeffco school for most medically fragile students) without any community input. Tried to censor AP US History classes, angering citizens and prompting thousands of students to walk out in protest. Hiring of a separate board attorney for the first time in board history despite no community input or discussion with minority board members. A violation of State Sunshine Law. Process for hiring current Superintendent included no job description and violations of State Sunshine Law. Spent $40,000 on a national superintendent search with 1 finalist from Douglas County. Refused to fund full-day kindergarten for our most at-risk students despite community support. Failed to keep promises from the 2012 bond campaign, which voters supported to keep our kids warm, safe, and dry. Limiting public comment at Board Meetings and selectively enforcing time limits and new rules. Majority Board members involved in cyberstalking, bullying, and attempted to publicly intimidate a student at board meetings. Majority board member posted links to hate group online. Jefferson Plan – Discussions with the community did not take place until the plan was near finalization, neglected to provide initial info to this predominantly Latino community in Spanish. Alameda Plan –No discussion with community in advance of presenting a near final plan. Fletcher Miller – School community learned of losing 2 RNs after the decision had been made. After the community rallied, the school was allowed to keep its nurses. Social Workers – School communities with GT Social Workers learned of losing social workers after decision had been made. After the school community rallied, the decision was reversed. Wheat Ridge Plan to relocate Everitt Middle School, Manning Option School and split Maple Grove – Motion John Newkirk at the March 5th Board meeting with NO community input, NO staff input. Poor stewardship of taxpayers’ dollars add up! These bad decisions (with total lack of transparency) are costing the district and taxpayers. $900,000+ district property assets relinquished, endangering $15 million more in undeveloped District assets including Rooney Ranch Elementary School – contrary to Capital Asset Management Committee’s advice, Board Majority refused to appeal decision on 2090 Wright St.
Our teachers are leaving! 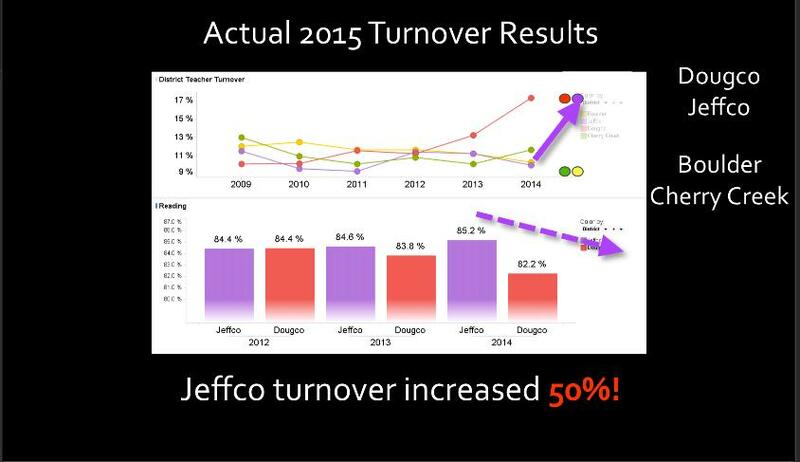 A 50% increase in great teachers leaving Jeffco!